I went this afternoon to visit the Lochness monster (because it was a drizzly day, with limited visibility—perfect conditions, in other words, for the shy serpent to show its face). 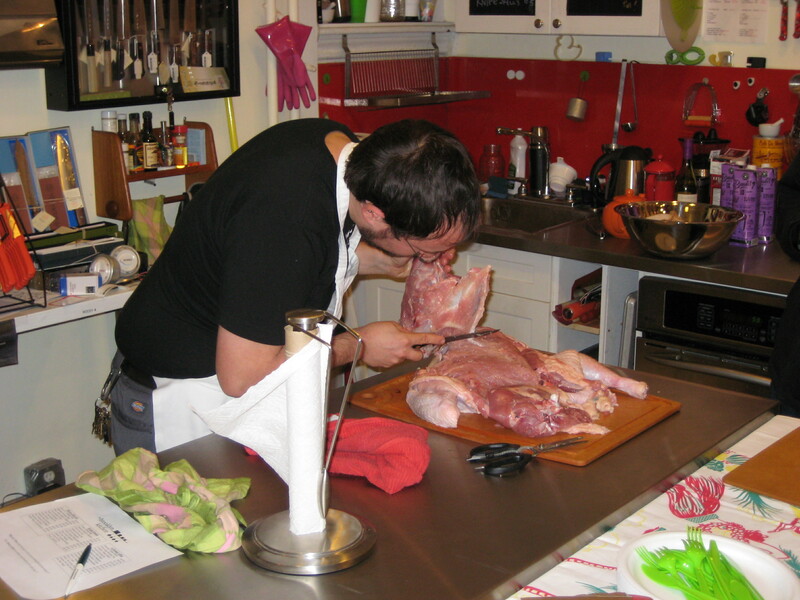 Then I sped back to Williamsburg to attend a cooking demonstration at The Brooklyn Kitchen on how to de-bone a turkey. I wasn’t born yesterday, but I didn’t know such a thing was possible. The idea is that the turkey cooks faster without bones, and you can plump it up with more stuffing than you could force inside the familiar bony T-day bird. Also, you can carve it more elegantly when there are no bones. Or you can make a turducken—every vegetarian’s nightmare—in which the turkey is stuffed with a duck that is stuffed with a chicken. De-boning the turkey doesn’t look so hard but it is not for the squeamish. You have to get down and dirty with the bird. Surgeons and taxidermists will have an advantage. The Brooklyn Kitchen’s blog has now released a picture of Sarah Gentile’s Pumpkin Gobble Gobble, the yummy winning entry in Wednesday’s Bodega Challenge. It also provides the complete recipe, which requires only $14.57 worth of bodega ingredients: 1 & 1/2 cans pumpkin (not pumpkin pie mix), 1 can coconut milk, 1 bag marshmallows, 1 can cranberry sauce, 1 can candied yams in heavy syrup, 1 small package pistachios, 1 small package walnuts, 1 apple, and 1 lemon or lemon juice. My loyalties were torn again last night. I wanted to go to the Marshall Chess Club* and watch the New York Knights in person in the first round of the playoffs in the U.S. Chess League. But I also wanted to attend the one-year birthday party of The Brooklyn Kitchen, a groovy store in über-groovy Williamsburg, the section of Brooklyn in which I encamp whenever I’m in the city. My stomach won out, but that’s because I could be really nerdy at the party and occasionally fire up my laptop to look online and check on the progress of the Knights. The highpoint of the party was the Bodega Challenge, a cooking competition in which people brought Thanksgiving side dishes that they had prepared from ingredients purchased at a bodega. There was a $20 cap on the ingredients, and the contestants had to produce receipts. The bodegas had to be pre-qualified by Brooklyn Kitchen: they weren’t supposed to sell sushi, kombucha, imported beer besides Heinekin, organic milk, or Pirate’s Booty, and they couldn’t take credit cards. A true bodega would sell lottery tickets, Velveeta, and individually wrapped slices of Kraft cheese. It would have a resident cat and a Plexiglas divider between the customers and the cashier. Some entrants tried to go upscale with carrot ginger pumpkin soup, but the judges singled out a gloppy marshmallow concoction festooned with a faux turkey made from apple slices and post-expiration-date pistachios. When I peaked at the Knights, top board Hikaru Nakamura had reached a queen and pawn ending. Sending his king to the center of the board, he planned to jettison all of his kingside pawns in an attempt to queen a pawn on the queenside. The game turned out to be a draw because his opponent could spoil the fun by perpetually checking Nakamura’s king. His teammates, Irina Krush, Jay Bonin, and Irina Zenyuk, all came through with wins to wallop Philadelphia and advance to the semifinals next Wednesday against Boston.